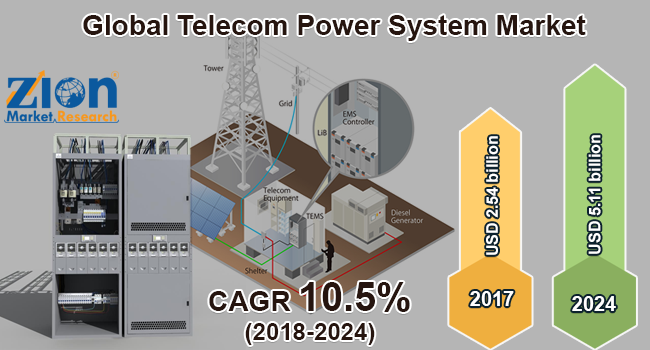 Global Telecom Power System Market expected to reach approximately USD 5.11 billion by 2024, with a CAGR of 10.5% between 2018 and 2024. Growing adoption of the hybrid power system is driving the telecom power system market growth. The report covers forecast and analysis for the telecom power system market on a global and regional level. The study provides historic data of 2015-2017 along with forecast from 2018 to 2024 based on revenue (USD Billion). The study includes drivers and restraints for the telecom power system market along with the impact they have on the demand over the forecast period. Additionally, the report includes the study of opportunities available in the telecom power system market on a global level. This report offers comprehensive coverage on global telecom power system market along with, market trends, drivers, opportunities, and restraints of the telecom power system market. This report includes a detailed competitive scenario and product portfolio of key vendors. To understand the competitive landscape in the market, an analysis of Porter’s Five Forces model for the telecom power system market has also been included. The study encompasses a market attractiveness analysis, wherein all segments are benchmarked based on their market size, growth rate, and general attractiveness. This report is prepared using data sourced from in-house databases, secondary, and the primary research team of industry experts. The report provides company market share analysis in order to give a broader overview of the key players in the market. In addition, the report also covers key strategic developments of the market including acquisitions & mergers, new product launches, agreements, partnerships, collaborations & joint ventures, research & development, and product and regional expansion of major participants involved in the market on a regional basis. The study provides a decisive view on the telecom power system market by segmenting the market-based on component, grid type, power source, and region. All the segments have been analyzed based on present and the future trends and the market is estimated from 2018 to 2024. By component, the market is segmented into rectifiers, converters, controllers, heat management systems, generators, circuit breakers, a distribution unit, protection devices, and others. By Grid, the market is segmented into on-grid, off-grid, and bad grid. On the basis of the power source, the market is segmented into diesel-battery, diesel-solar, diesel-wind, and multiple sources. The regional segmentation of the market includes the current and forecast demand for North America, Europe, Asia-Pacific, Latin America, and the Middle East and Africa with it further divided into the U.S., the UK, France, Germany, China, Japan, India, and Brazil. The report covers a detailed competitive outlook including the market share and company profiles of some of the key participants operating in the global telecom power system market include Delta Electronics, Eaton,GE Industrial Solutions, Huawei Technologies Co., Schneider Electric, Vertiv Co., AEG Power Solution B.V., Microtek International Inc., Mitsubishi Electric Corporation, Cummins Power, Myers Power Products Inc., Ascot Industrial S.R.L., and Unipower among others.